One of the most vital aspects of orthodontics is the ability to take precise images of the teeth and mouth, which is where X-rays come into play. These X-rays will allow Dr. Kattner to craft a customized orthodontic treatment plan that will be as efficient as possible. As you might expect, we at Kattner Orthodontics are always committed to providing the latest in state-of-the-art technology, which is why we’re glad to go one step further and provide a newer and more beneficial form of X-rays – digital X-rays. 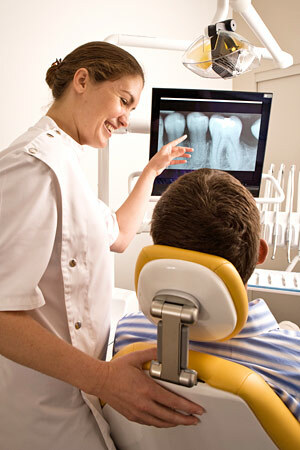 First of all, digital x-rays have an advantage over film x-rays in that they are immediately available for viewing. But more importantly, digital X-rays cut the amount of radiation exposure to a patient by as much as 90 percent compared to traditional x-rays with chemical processing (which, by the way, was really bad for our environment!). Digital X-rays will capture a higher-quality image while limiting radiation exposure to the lowest dose possible. A clearer picture. We can get more information from a digital X-ray because it’s sharper and it can also be enhanced in a number of different ways. Areas of concern can be magnified and the contrast can be increased or decreased. We’ll even be able to compare them on-screen to any previous X-rays, making it easier for us to detect the most minor of changes. Easier sharing and storage. Digital X-rays are a better visual aid for patients allowing them to understand their diagnosis better. They can even be e-mailed to patients, allowing for much easier access. No chemical processing and no waiting. Since there’s no film to process with digital X-rays, there’s no need to wait for pictures to develop and there’s also no toxic chemicals to dispose of. Dr. Kattner will be able to immediately show these images on a computer screen. Even though X-rays pose very little risk, they’re not completely risk-free, no matter how much technology reduces your exposure. That’s why we’ll only use them when the benefit of obtaining better diagnostic information outweighs the small risk of the procedure. This holds true of CT (computed tomography) scans as well. No matter what type of technology is being used, your safety is always our priority. If you’d like to learn more about our digital X-rays, we urge you to contact us. If you want to schedule an appointment with us, please feel free to fill out our online appointment request form. We hope to hear from you soon to provide the best orthodontic treatment!